Betsy Denney has a BA in Dance from Brigham Young University. She is certified with the ISTD in licentiate ballroom and latin. She is an adjunct faculty faculty member in the Dance Department at BYU where she teaches technique classes and coaches one of the performing teams. Betsy is a 2–time United States Amateur Smooth Champion, BYU Amateur Ballroom Champion, United States Youth 10–Dance Champion, and United States Youth Ballroom Champion. She started ballroom dancing on a formation team at the age of 12 and then came to BYU where she had the privilege of touring with the Ballroom Dance Company for 5 years. As a student, she received the top BYU Student Dance Instructor. During that time, she was able to compete with the team in Blackpool, England 2 times. She and her husband Karson also competed professionally in the American Smooth style where they placed in numerous rising star and open professional finals. 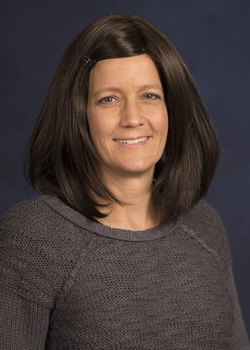 Betsy started teaching in the BYU Youth program in 2001. She has coached teams at the Pre-Teen, Junior, and Youth levels and now enjoys her role overseeing the Youth Dancesport Program. She loves working with all of the youth and parents in this great program!!! Karson started ballroom dancing at the age of 10 and it has been a big part of his life ever since. As an amateur competitor, Karson was the 2-time United States 9 Dance and Rhythm Champion, United States American Smooth Champion, and a BYU Amateur Latin Finalist. He had the opportunity to dance on BYU's touring team for 4 years and competed with them in Blackpool, England where they won the British Latin Formation Championship. Karson and his wife Betsy competed professionally in the American smooth style where they placed in numerous rising star and open professional finals. He is licentiate certified in both the latin and ballroom styles with the ISTD. Along with his extensive experience as a dancer, he has a Bachelors Degree in Global Studies and Masters Degree in Mass Communications. He is an Artist Manager at BYU's Performing Arts Management where he is the Artist Manager for BYU groups including BYU's Ballroom Dance Company. He has been teaching in the youth program since 2003 and truly enjoys it! Brittney is originally from Orem, Utah and started ballroom dancing at the age of twelve in the BYU Youth Ballroom Program. She grew up competing on the Youth Teams, as well as competing in ten dance individually. One of her greatest competitive achievements was winning the U.S. Youth National Ten Dance Title in 2002. She danced on the BYU Tour Team in college and toured the South Pacific, Ukraine, Western Europe and Asia. She met her husband, Craig, through ballroom dance and has been happily married for five years. Brittney and Craig directed the Timpview High School Ballroom Program for two years growing it to more than 250 students including 6 competitive formation teams, several of which placed in the top five in Division I of the National Dancesport Championships. In addition to ballroom, Brittney has coached multiple genres of dance/tumbling for the past twelve years, teaching preschool students through adult. She has a Bachelor's Degree from Brigham Young University in Marriage/Family/Human Development and has taken numerous courses focusing on child psychology and development. Brittney has been teaching in the BYU Youth Program since 2013. A Provo native and an alumnus of BYU Youth, as well as Brigham Young University, John Graham has been involved with ballroom dance since the age of 12. He had an 11 year competitive career, in which he enjoyed competing in both American and International styles of ballroom. Three notable accomplishments of his career are United States Youth Latin Champion, United States Youth Ten Dance Champion (Partner - Natalie Schulz for both), and United States Amateur Latin Semi-Finalist (Partner - Krista Treu Derrington). After graduating from high school, John competed in Blackpool with the BYU Latin Formation Team in 2001 and 2004, completed two world tours with the BYU Touring Company, and subsequently retired to finish his degree in the School of Family Life. As a teacher John has coached individuals and teams. He has had the privilege of coaching at Pacific Ballroom Dance, Island Style Dance, and now here at BYU Youth. John’s hope is to share what he knows, and learn all he can from the students he will be working with. Here’s to a great year. Allie has always loved to dance. You could say it runs in her blood, with both her mother and grandmother being dancers. She grew up dancing in the BYU Youth program. It was there she met and developed a crush on Kyle, who years later became her husband. Allie continued her training in college on the BYU Ballroom Dance Company. She traveled with the touring team to England, Scotland, Thailand, Vietnam and all over the United States. As amateur competitors, Allie and Kyle became 3x BYU 10-dance champions as well as 2x United States American Smooth Champions. In 2012, Allie graduated with a degree in Dance Education and a minor in Health Education. Soon after Kyle and Allie moved to California to pursue a professional dance career. Together they became 2x United States and 3x World Open Professional Smooth Finalists, United States 9-dance finalists as well as Blackpool Smooth Finalists. They were also proud to be one of 5 couples invited to demonstrate a smooth exhibition at the Blackpool Dance Festival in 2015. Allie is a national level adjudicator with the NDCA having completed all her certification through the USISTD. Allie is excited to be back in Utah and working with the Youth program! Natalie Schulz is originally from Provo, Utah. Having grown up in a ballroom dancing family all she can ever remember wanting to do was dance. When she turned 10 years old her parents put her in the BYU Youth Ballroom Program. She quickly fell in love with dance and all the exciting opportunities that came with it. As an amateur competitor Natalie competed in both formation and individual competition. She had the opportunity to be a part of BYU’s touring team for 5 years, and competed 2 times in Blackpool, England. As an amateur competitor Natalie was a 4 time Undefeated United States Amateur Theatre Arts Champion, 2 time Amateur Latin United States Semi Finalist, and a 2 time Amateur 10-dance Finalist. She also Graduated from BYU with a degree in English. After graduation Natalie traveled to New York City to pursue her dreams of becoming a professional ballroom dancer. There she met and began to compete with her Husband Dawid Schulz in American Smooth. Together they won the United States Rising Star American Smooth Championships in 2011. They were World Cup American Smooth Finalists in 2010-2012, 5 time United States American Smooth Semi Finalists 2011-2014, and World American Smooth finalists 2014. Together they have journeyed from NYC to California and now to Utah in hopes of teaching, developing, and inspiring young minds in ballroom dance. BYU opened the door for her to live her dreams. She is now excited to have come full circle and become a part of the journey for the talented dancers of the BYU Youth ballroom dance program. Julie began her ballroom dance career at BYU and toured with the Ballroom Dance Company for two years which included competing at the British Formation Championships in Blackpool, England. She was a four-time undefeated Amateur Standard Champion at BYU and also a two-time United States standard finalist. While at BYU, she served as the company’s president and also received the highest Gold Bar Standard Medal’s Exam score earned at the University. She and her partner then went on to be placed in the top-twelve in the Professional Rising Star Standard Division. She and her husband owned a dance studio where their teams earned multiple National titles. In their last, year they prepared 11 medleys to compete at United States National competition. She is thrilled to be a part of the BYU Youth Dancesport Program. for 4 wonderful years where she competed 2 times with the team at the British Championships in Blackpool, England—winning first place. Dancing with the touring company allowed her to perform abroad in several countries including England, Scotland, Wales, Chile, Argentina, France, Spain, Switzerland and Belgium. Hannah has a passion for teaching dance, creating, connecting and learning from her students. Hannah has been teaching in studios in Washington and Utah since 2011 and she is now thrilled to be a part of the BYU Youth Dancesport Program! BYU as an Assistant Program Administrator.